It is presumed to be one of the frequently reported sleeping issues especially among women. They experience problems like a sense of drowsiness upon waking up and facing troubles in getting back to sleep. It is estimated that 1 out of 7 adults are encountering chronic insomnia, with 1 out of 4 developing it each year. This could significantly affect your daily regimen like executing complicated tasks, getting work done in the office, going to school and taking care of ones self. The average adult should get at least seven to eight hours of consistent sleep every night to rejuvenate their mind, body, and even their spirit. It can be really taxing on a person when they are suffering from chronic insomnia. Primary insomnia is a medical condition where an individual is facing sleep problems; however it is not linked to any sorts of health issues. Secondary insomnia is a sleeping disorder which is primarily due to chronic ailments like arthritis, cancer, depression and asthma. In some cases, this can be caused by consuming a lot of alcohol. What is guided meditation for insomnia? A recent study published by JAMA Internal Medicine revealed the fact that guided meditation for insomnia helps individuals that are encountering issues like sleeping disorders. Guided meditation for insomnia helps by enabling you to stay focused on emotions, expressions and thoughts. There are certain sleep meditation sessions which are conducted to improve sleeping patterns. It can also help in alleviating symptoms of high blood pressure, stress, anxiety, depression. Guided meditation is characterized by paying attention to breathing without deviating towards contemplating the future or ruminating on the past. Experts recommend using guided meditation for a duration of about twenty minutes. The most useful forms of guided meditation for insomnia work by focusing your attention at night to create the perfect conditions for a good nights rest. For example, the guided meditation may guide you through a process of “powering down” your muscles and tension, and letting go of thoughts of things that happened during the day. Also, chanting the word ‘Om’ is one of the best options to stay calm and relaxed. In addition, repeat the process of inhaling and exhaling and focusing on the breath for a certain period of time. Intense relaxation techniques such as meditation has been proven to enhance the overall sleeping time thereby improving sleeping quality as well. This would enable a person to stay focused and fall asleep quicker than ruminating on thoughts when trying to sleep. In addition, meditation is indisputably a remarkable tool that can help reduce the intake of sleeping pills. It is an ideal option especially for people who are seeking a natural and medication free method to alleviate sleeping disorders. There are no side effects or risks related to meditation. Meditation can be effectively blended with similar sleeping techniques like cognitive behavioral therapy. Apart from eliminating sleeping disorders, it is very helpful in reducing the level of blood pressure thereby alleviating symptoms of fear, anxiety and depression as well. A cost-free tool is best suited for people irrespective of ages. Better yet, there are guided meditation apps you can use to help with this. Alternatively, you can checkout our YouTube channel which contains many free guided meditations. Regular sleep is needed in order to bring down blood pressure levels, consumption of oxygen and respiratory rates etc. Guided meditation was also found useful in improving the metabolic, immune functions and endocrine system. Melatonin is a vital hormone, anti-oxidant and immunomodulator that stabilize our immune system. It also acts as an anti-agent that helps in promoting the well-being of a person. Those who persistently meditate for a longer period can enhance their level of melatonin. However, its production can gradually decline as one gets older. It is now available in supplement form and can assist in overcoming sleeping disorders. 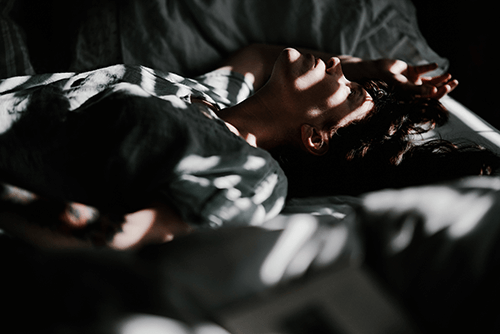 Researchers discovered the fact that a combination of cognitive behavioral therapy and guided meditation could produce remarkable results in dealing with insomnia. Another benefit includes bringing down the intensity of sleeping disorders and symptoms like fatigue, anxiety and depression. Guided meditation for insomnia can help adults who are struggling to cope with chronic ailments. With meditation, they have displayed signs of improvement with respect to focus, attention, overall well-being, etc. As a result, the sleeping disorders among patients have reduced drastically. According to scientific studies, delta, alpha and brainwaves are also improved upon performing meditation. It makes you feel refreshed and energized while waking up in the morning. An expert commented that meditation plays a pivotal role in overcoming symptoms of fear, anxiety and depression. It guides us in bringing us back to the present and now. Guided meditation for insomnia is indeed a remarkable relaxation tool to alleviate sleeping disorders. Firstly, choose a suitable location to lie down or just sit and relax. Slowly close your eyes followed by inhalation through the nose and exhalation through the mouth. If you feel that your mind is drifting towards thinking, try to bring back the attention to the breath. Repeat the process for a duration of about five minutes. Next, continue to watch your breath. Don’t force the breath here, just watch each inhalation and exhalation. Now, begin to notice the weight of your body. Notice the points of contact. Start at your toes and begin to imagine yourself slowly powering down each muscle in your body, starting with the feet, and slowly moving up until you reach the top of your head. Think of powering down your muscles as pulling a level slowly, releasing all tension and energy from each muscle. When you finally reach the top of the head, you can either stay seated or lying down, or move into a position that’s more comfortable for you, preparing for sleep. If it helps, begin to count down from 1000, and sleep.